The setting was intimately familiar to Wyeth almost his entire life, a view looking down over the Kuerner farm and the nearby hills of the Brandywine Valley in Pennsylvania. The artist knew almost every inch of the roads, buildings and fields we see in the distance below. Historians and others may argue for some time whether his future reputation will rest on the landscapes or portraits (respectively descended from two of his artistic idols, Winslow Homer and Thomas Eakins). "Snow Hill" is unusual in the merging of the two -- one open, silent and vast; the other intimate, animate and active. The foreground hilltop, receding valley, and broad sky constitute a painted tour de force of whites, off-whites and cream colors. Its poetic emptiness recalls the stark eloquence seen in but a few of Wyeth's other strongest compositions -- such as "Christina's World" (1949), "River Cove" (1958) and "Airborne" (1996). Atop the hillside we view the improbable scene of a Maypole dance at Christmas time. The seven ribbons descending from beneath the tree above mark the artist's seven decades. In a surreal vision, Wyeth assembles prominent figures from his life and art who appeared in major paintings over the years. Holding hands from left to right across the foreground are Karl and Anna Kuerner, followed by William Loper and Helga Testorf. In the back right is the family friend and neighbor Allan Lynch, wearing his telltale hat with earflaps flying, and finally, partially obscured, a figure with billowing brown coat who recalls the artist's wife, Betsy, posing years earlier in the snowy courtyard of their Chadd's Ford farmhouse. In this enumeration we realize the group only comes to six, suggesting a missing seventh figure. Possibly Christina Olson, the most enduring of Wyeth's Maine subjects, made famous by his first masterpiece, "Christina's World," is not present, since her paralysis would keep her from dancing. Or perhaps the implied seventh individual might be the artist himself, participant in their lives and unseen orchestrator of this imaginary get-together. In any case, this is a witty and exuberant conjuring of artistic imagination. 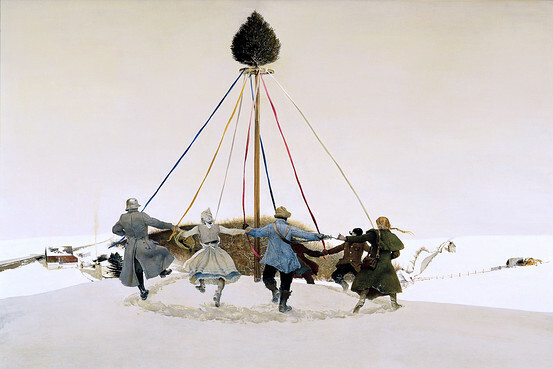 Not surprisingly for Wyeth, however, there are notes of darkness beneath the celebratory gathering: Wyeth had lived through Karl Kuerner succumbing to cancer, Allan Lynch to suicide, and William Loper to madness. Even so, what we ultimately experience here is the enjoyment of art, life and creativity, an idea subtly but vividly conveyed by the air-touched ribbons. They contain the most intense colors and free-flowing brushstrokes in this picture. Wyeth once described how he approached their execution. In part remembering his childhood games with friends, dressing up as soldiers or medieval knights with play swords or sabers, he envisioned here addressing the painting like a fencer with an epee. With arm and brush extended, he swiftly moved to the surface and slashed each stroke of color from the apex down to the figures.